The other day when Sara Farber met friends for dinner at a little sushi place on the Upper West Side, one of them mentioned something fabulous. In response Sara blurted out, "Oh, me love that!" Oops. Syntax problems are an occupational hazard when working for the big yellow bird. "The language of the Muppets sort of creeps through," Farber says of her occasional lapses into Cookie Monster-speak. But that is perhaps to be expected. After all, she says, "I have a job where I sit in design meetings trying to decide if a kangaroo is funnier than a chicken." Sara Farber thrives in the Sesame Workshop's creative environment. 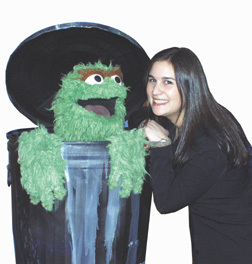 As a producer in the Interactive Technologies group of the Sesame Workshop (formerly known as Children's Television Workshop), Farber is responsible for bringing Oscar and Elmo, Cookie Monster, Big Bird, and dozens of other Muppets to young audiences in a computer gaming format. A typical Sesame Street game will take about nine months and more than a half-million dollars to develop from idea to the "gold master" that will then be copied and distributed internationally. Farber's job as producer is to oversee the design team that will invent stories, generate scripts, create original songs, devise educational activities, build animations and, with any luck, bring the whole project in on time and on budget. That last requirement is the hardest part of her job, Farber reports, and the unhappy duty of the producer is often the need to say no. "I work with so many talented people, and they all want to make the games so good, [going] beyond what was done before. A lot of my time is spent reeling it in." Which is not to say that Sesame Street games are passé. Among the most consistently popular titles aimed at 3- to 6-year-olds is "The Adventures of Elmo in Grouchland." Farber recently completed "Sesame Street Toddler" (due out later this year), and is currently at work on "Elmo's World: Shoes, Bugs, and Farms." These games demonstrate the same high quality and impeccable educational design that has made the morning television show a staple for three decades. A recent release that Farber produced, "Ernie's Adventures in Space," was a family title-of-the-year finalist in the software industry's equivalent of the Academy Awards. The Johns Hopkins ROTC Hall of Fame was established in 1997 and broadened two years later, making eligible all Hopkins alumni who served in the military, regardless of ROTC affiliation, component, or rank. The program was renamed the Distinguished Military Alumni Program. This year's honorees included George C. Creel, Engr '55, a former executive vice president and acting chief officer for BGE who served in the Army Reserve as an engineer officer for over 10 years and is a former member of the National Advisory Board for the Whiting School of Engineering. Also honored was Edward L. Rowny, Engr '37, (pictured at right) the longest-serving U.S. Joint Chiefs of Staff representative to the Strategic Arms Limitation Talks in Geneva, who commanded troops in World War II, Korea, and Vietnam. The third honoree was Clarence D. Long III, A&S '65, an associate general counsel for the Air Force who was awarded the Silver Star, the Soldier's Medal, a Bronze Star, and two Purple Hearts for his service in Vietnam as an infantry platoon leader. In 1966 he bravely exposed himself to direct enemy fire in order to lead his platoon and to save fallen comrades. Gene Detroyer recounts the day he told his business partner that the rights to the Today Sponge© were up for sale. "That's a great product!" Detroyer remembers partner Robert Staab shouting, leaping from his chair, and slapping his hand on his desk. It was a sight not soon forgotten. "This guy is six foot five, about 350 pounds," says Detroyer, "so when he jumps up and shouts, you know it's something special. I knew right then we'd found the perfect platform for what we are trying to do." Detroyer and Staab are men on a mission. With their fledgling company, Allendale Pharmaceuticals, they're trying to introduce additional choice in a contraceptives market largely defined by condoms and a handful of variations on the contraceptive pill. Staab, a toxicologist by training, holds patents on a contraceptive sponge, on dissolvable film that can be used as a delivery vehicle for spermicides, and on a disposable diaphragm. However, before any of these inventions can be brought to market, they must undergo thorough and very expensive clinical trials to satisfy the FDA of their safety and efficacy. Detroyer says new FDA certification for the sponge (below) is agonizingly slow. The Today Sponge©, by contrast, is a contraceptive product already approved and marketed in the U.S. It seemed the perfect first product for Allendale Pharmaceuticals. A cervical barrier that prevents pregnancy by releasing the spermicide nonoxynol-9, the Today Sponge© was taken off the market in 1995 when the FDA discovered safety violations; its makers decided to close their manufacturing facility in New Jersey because it would have been too costly to make the necessary improvements. No health risks were associated with the sponge--it was the plant, not the product that was at issue--but manufacturer American Home Products decided that for $20 million in annual sales, it wasn't worth the bother to reestablish manufacturing the sponge elsewhere. Detroyer, Staab, and a group of investors purchased the rights to the Today Sponge© (at a figure Forbes magazine puts at $7 million), and negotiated with a Pennsylvania pharmaceutical manufacturer to produce it. But a new manufacturer means new FDA certification, a process that has proven agonizingly slow. "The process of revalidating the plant for FDA approval has been tougher than we expected," Detroyer says. "A lot depends on how fast the FDA moves forward; we already have approvals in Canada and the U.K., which is ironic." In the meantime, a small but vocal cadre of Today Sponge© enthusiasts has been petitioning the FDA to get the product back on shelves. There is a website (www.birthcontrol.com) where Forbes reports a waiting list of 4,000 anxious Today Sponge© customers. And most famously, an entire episode of Seinfeld revolved around Elaine's efforts to hoard her dwindling supply of sponges. To natives, it's the Badger State, but for many out-of-towners Wisconsin is the place with all those black-and-white dairy cows. Never mind that the state's economy is powered by internationally known manufacturers ranging from Briggs & Stratton to Harley-Davidson, and increasingly, by biotechnology, insurance, and financial services. Holsteins still dot the landscape in Wisconsin, the nation's leading producer of dairy products, and dominate the landscape of public perception. McCallum meets the press. Which is why the country's newest governor, Scott McCallum, has emergency response teams "keeping a few close eyes" on foot-and-mouth disease. McCallum, who served 14 years as the state's lieutenant governor before assuming the state's executive office February 1, succeeds the popular Tommy Thompson, who was tapped by President George W. Bush to join the administration as Secretary of Health and Human Services. McCallum becomes only the second Johns Hopkins alum--after Woodrow Wilson, A&S 1886 (PhD)--to become a U.S. governor. The annual World Dairy Expo in Madison is slated for October 3-7 this year, and so far there has been no announcement of cancellation. "The disease represents a threat, but also an opportunity for Wisconsin farmers to increase exports," McCallum notes. "The state hosts a great number of international travelers every year who visit our farms and dairy operations to see what makes us so successful. We're taking steps to make sure that this travel doesn't endanger our industry." We like to think of Mount Vernon as our campus," says Robert Sirota, director of the Peabody Institute. "We are no longer situated on one city block. We have offices, a piano store, a bookstore, a cafe." And, the director adds, Peabody's neighbors include the Walters Art Museum and Center Stage, making Mount Vernon an altogether artistic locale. Nevertheless, for many of the past 150 years the design of Peabody's campus has worked to keep the neighborhood out. With its walled courtyards, labyrinthine hallways, and entrances leading to nowhere, Peabody can be a puzzle to outsiders. The new Grand Arcade That's about to change. This summer, the school begins work on a $24 million renovation project that will transform wasted space into hubs of activity, replace architectural confusion with what Sirota calls "user-friendly and rational" design, add practice and performance space, and radically improve Peabody's entrances. Iron bars and guardhouses will disappear. A Grand Arcade with curving flights of stairs will cascade from Mount Vernon Place to the Peabody Plaza. The arcade, roofed in glass, will offer a sunlit gathering place for students, faculty, and visitors. Peabody holds approximately 800 public events annually, attracting in a year as many as 40,000 members of the public--equivalent to every man, woman, and child in 10 counties in North Dakota, or one out of every 16 Baltimoreans. "We want to make this a place that people love to go to again and again," explains Sirota. The director's favorite aspect of the new design? "I like the way it completes the old buildings," he says. "It has the fabric and design of the 19th century, yet is state-of-the-art, serving the purposes of a 21st-century Peabody." During the 1920s, a Hopkins Hospital porter named Benjamin Frisby kept his pet turtles in a pen between the Wilmer Eye Institute and the original hospital Administration Building. His growing menagerie attracted the attention of gynecologist Edward Kelly, who asked to borrow them for a day of fun and revelry. Thus was born the 1931 Johns Hopkins Hospital Turtle Derby, a smash hit that quickly grew into an annual all-day party, held on the Friday before Preakness. House staff in each department put on satirical skits, and even roasted faculty members, much to the delight of patients, staff, and neighborhood families who attended. Turtle-race gambling proceeds purchased libations for a party afterward that often went on into the wee hours. But by 1978, the party had died out and the derby was defunct. In 1954, house staff send up the Department of Surgery in a skit. Louise Cavagnero, who was a hospital assistant vice president until her retirement in 1985, explains, "It just became too much--all the dressing up, the bands, the planning. 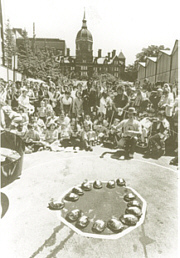 You must understand, house staff don't work 40-hour work weeks..."
Nevertheless, two years later, in 1980, a group of medical students resurrected the Turtle Derby, this time as a fundraiser for the hospital's children's programs and an area day care center. Cavagnero helped the students get the necessary financial support needed to print the programs, advertise the event, and rent the turtles from a company in New Jersey. The modern derby--still the "most exciting sport in the world." Each year the red-eared turtles spend the days leading up to the event in the courtyard outside the hospital cafeteria. 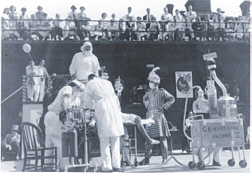 Then, race organizers cart them to the PreClinical Building courtyard, where as many as 500 spectators--young hospital patients hooked up to IV machines, children in casts, and hospital faculty and staff--all stand ready to cheer their favorites to victory. The racing schedule includes up to six heats, such as Turtle Trot for Tots and The Mudslinger Marathon. "One year it was raining, so we did the derby in the Meyer gym," recalls Anne Sneed, coordinator of Student Services. "It was never allowed after that. It was too hot in that gym, and none of the turtles ran. None of them did anything." The turtles start out in a tight circle in the middle of the track. Whichever turtle is the first to cross the outside perimeter of the track wins. First-year medical students, dressed as jockeys, can't touch the turtles, but they are known to crouch on the ground beside a reluctant reptile and sing, coax, or whistle. It can be tough work, noted a 1958 Baltimore Sun article, which remarked upon the turtles' "indifference, and innate tendency to remain quiescent even under the most frantic persuasion." The 2000 derby raised $3,500, which was donated to the Child Life Program and nearby Walter Perkins Day Care Center. 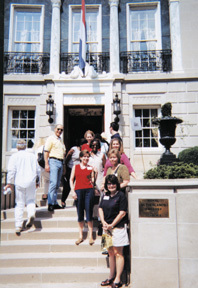 D.C. alumni pause on their walking tour of Embassy Row. The Washington, D.C., Chapter rivals the Metropolitan New York Chapter in unique entertainment opportunities. That wealth, points out chapter president Greg Fortsch, A&S '91, also presents a challenge. In a city teeming with world-class museums, theaters, and music halls, the chapter strives to offer its alumni behind-the-scenes exclusives. The embassy parties, for instance, have been a big hit. In the past several years, Washington alumni have dined at, listened to music in, and toured the embassies of Austria, Mexico, France, China, Italy, and Romania. In addition, the chapter takes advantage of its proximity to Baltimore and to Hopkins faculty. "There is often," says Mary Frances Repko, A&S '89, "an intellectual component in our events. And the continuing studies (SPSBE) and graduate studies presence (SAIS) in Washington are great assets." * There are 17,507 alumni and friends in the Washington, D.C., area. * 53% graduated after 1990. The largest percentage, 27%, graduated from Engineering. The smallest percentage, 2%, graduated from Medicine. The Distinguished Alumnus Award recognizes personal, professional, or humanitarian achievement. Pedro M. Cuatrecasas, Med '64, House Staff '62-64, Fac '70-75, as a pharmaceutical research director has played a key role in the discovery, development, and FDA approval of some 45 products for therapeutic areas including diabetes, HIV, epilepsy, cancer, and heart disease. Willard Hackerman, Engr '38, graduated at 19 and within two decades rose to president (and later CEO) of the acclaimed Whiting-Turner Contracting Company. A University trustee emeritus, he has been recognized for his outstanding civic leadership in the Baltimore region. Timothy S. Harrison, Med '53, House Staff '53-57, a leader in U.S. academic medicine and in humanitarian service to less advantaged countries, is world renowned for his work on the physiology of the autonomic nervous system and for the surgical treatment of endocrine disorders. John W. Runyan Jr., Med '47, House Staff '47-48, a professor of endocrinology and preventive medicine, pioneered as early as the 1960s a network of neighborhood health clinics around Memphis that made health care accessible and affordable to the less privileged. Judson J. Van Wyk, Med '48, House Staff '48-50, Fellow '53-55, an international leader in endocrine research, has greatly expanded the understanding of hormone function and significantly advanced the diagnosis and treatment of growth abnormalities in children and adults. The Heritage Award recognizes outstanding service to the Johns Hopkins University. William Polk Carey, who has given Hopkins his expertise and financial support as a trustee, member of the Nitze School's Advisory Council, and member of the National Council for Johns Hopkins Medicine, has also helped fund an entrepreneurship curriculum for Homewood undergraduates. Benjamin H. Griswold IV, University trustee and chair of the Peabody Advisory Council, has long provided exemplary leadership and generosity to the University. Recent family gifts to Peabody include a renovated North Hall, named for his mother, Leith Symington Griswold. Christian H. Poindexter, a University and Johns Hopkins Medicine trustee, is chair of the Advisory Council of the School of Professional Studies in Business and Education. A civic leader in Baltimore, he has helped secure corporate support for SPSBE initiatives.